Built in the year of the Pattison's blending crash, Ardmore distllery has survived hard times and is still pumping out tasty, tasty spirit. After 109 years as an operational distillery Ardmore has (finally!?) been released as a single malt by its owners. It has been a darling distillery of the independent bottlers for many years, a quiet workhorse producing over 5million litres per annum, and has been the heart of Teacher's blended whisky for over a century. The distillery has produced both peated and unpeated malts specifically to supply the blending market and this expression of Ardmore is of the peated variety. Further, it has undergone a second maturation, or has been 'finished', in smaller oak casks, traditional quarter casks. Some of us have heard the phrase 'quarter cask' in reference to a new product from Laphroaig (Malt Mission #128). Since the break-up of Allied Domecq in early 2006, Beam Global has owned both Laphroaig and Ardmore. We can only assume that the treatment of Ardmore Traditional Cask is similar to that of Laphroaig Quarter Cask: Whisky that has spent 5 or 6 years in ex-bourbon hogsheads or barrels that is then transfered to smaller casks where it can be exposed to more oak, absorb more of the flavours that come with maturation and is then released with no age statement, first at Duty Free, then the UK, then the world. Now, I have to wonder, are these quarter casks first fill, or have they perhaps held something before... Laphroaig? Let's taste. Tasted with LDLJ in Copenhagen, Denmark. Her notes appear in quotes. Baked sweetness, flour, butter, ginger and/or cinnamon and brown sugar, some honey and black tea, with a dampness, a kind of moist, earthy, sweet peat smoke. "There is something Laphroaig about it." Wow, big burst of a smoky impact, slightly fishy, more baked sweetness with canned peaches, "mmm... apples." The big impact becomes gentler upon swallowing into shortbread and a bit of vanilla and bubblegum. But wow, smacks of smoke. 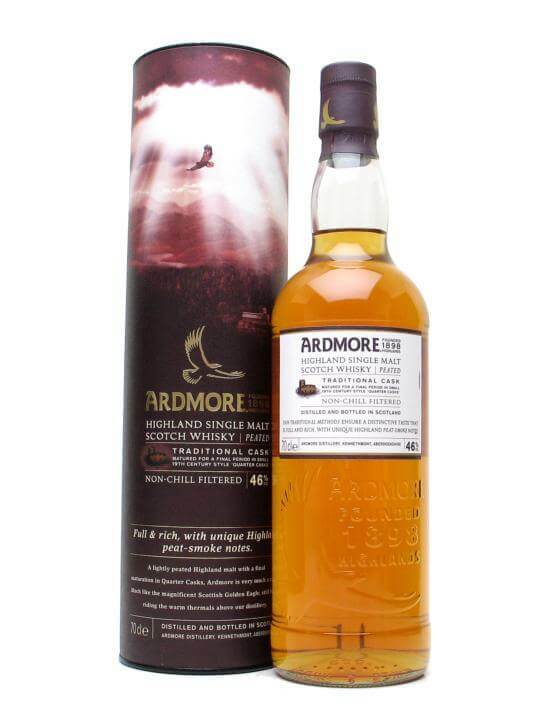 I think Ardmore has got to be one of the most over looked single malts by the whisky consuming public. A great quality scotch that would have far more fans if Beam Global would spend a few marketing dollars. They should learn a thing or two from Diaego. Marketing does build market share.